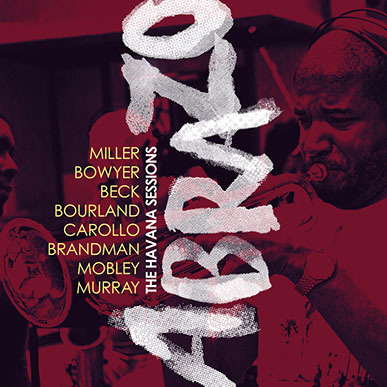 This Friday we’re releasing ABRAZO: THE HAVANA SESSIONS, the flagship release on our newest label, Ansonica Records. ABRAZO features two discs of new recordings we produced with our partners in Havana, Cuba during our first trip in early November 2015. To celebrate this exciting and important release, we caught up with the composers Bunny Beck, Roger Bourland, Don Bowyer, John A. Carollo, Mel Mobley, Michael F. Murray, Tim Miller, and Margaret Brandman to talk about their experiences recording in Havana. How did you decide which piece(s) to record in Cuba? John Carollo: When I think of Cuban musical culture the guitar and Big Band music comes to mind. What better marriage than the trumpet, being the most agile of the brass instruments, and the guitar, in which an entire orchestra of sounds can be produced? Tim Miller: It was easy – Hot Miami Nights was a perfect fit based on the style – mambo baby!! When Bob told me there was time to do two, I picked On An Autumn Day because I had previously done a small ensemble arrangement in the bossa nova style, which would easily translate to the big band version. And I think I was right. Mel Mobley: I felt like the character of my brass trio would work well in an unknown setting because it contains elements that connect to several different genres. Don Bowyer: I wanted to record something in an Afro-Cuban jazz style to take advantage of the local talent in that arena, but I also wanted something with some harmonic twists. Bugs and Gas seemed like the perfect vehicle for this. It is essentially a blues in F and a blues in B happening at the same time, with a remarkable Cuban groove underneath it all. How was your experience during your recording session different from others you’ve done in the past? Michael F. Murray: The dedication of the musicians to get it perfect was amazing to me. I’ve had great experiences with my PARMA sessions in Czech Republic and Boston, but the willingness of the Cuban choir and conductor to spend extra time getting the piece just right was extraordinary. Bunny Beck: As a pianist, I played piano on all my other recording sessions. This time, although I composed the pieces, I didn’t perform on the recording. JC: The musicians were in closer proximity and, therefore, musical issues could be resolved quickly and the musicians were able to give more input about their instruments vis-a-vis the music at hand. TM: Despite not being able to understand much of what was being said and communicated, it felt incredibly comfortable because everyone was so professional. Although there were a lot of people in the studio, it was a very laid back atmosphere – no pressure – just the pure enjoyment of making music!! How do you feel that the musicians you worked with in Cuba interpreted your writing and intent? with Latin American music. All these borrowings they understood immediately. Margaret Brandman: The musicians took great care with my scores and successfully achieved the sound I was after. There were some tricky rhythms and interlocking parts which they managed to bring off really well. This demonstrated to me that they had been rehearsing the material very well before the recording date. The percussionist who overlaid the tracks added a special magic to the entire experience. Even though I had composed the works some time earlier, they emerged with an amazing freshness – as if they had been written on the day before! JC: The musicians showed excitement and a deep understanding of the music. They played with enthusiasm and their interpretation showed a sensitivity for the overall inherent musical dialogue. TM: Aside from some minor technical hiccups, they did an incredible job. In fact, over and above what I expected. They totally “Cubanized” my music, which was why I went there to begin with. Mission accomplished!! MFM: The musicians are of the highest caliber, and they were extremely well prepared going into the session. The conductor and singers created a superbly musical interpretation of my piece. DB: Mine was an Afro-Cuban jazz piece, so they probably interpreted it better than I wrote it! Watching the percussionists lay down additional tracks after the rest of the band left was like observing a master class in Afro-Cuban percussion. BB: The musicians were excellent. I wrote the compositions as jazz pieces, and for this project, they were arranged as Latin jazz pieces by a Cuban music arranger who did a very good job. What aspect of the local culture outside of the studio resonated with you the most? RB: The non-connection to the internet. People actually talk to each other in the streets after work. I also loved the cuisine and the musical life. MM: The beauty of the landscape and the beauty/perseverance of the people are things that will never leave me. Difficult living conditions and the lack or scarcity of many common items do not deter or contain a positive outlook on life for the majority of the local people I met. JC: The calm, peaceful, musical nature of Cuba’s people. MB: I enjoyed our walks through the city; marveling at the historic architecture, discovering art works and sculptures in hidden places and encountering street musicians on the balmy evenings whose music drifted along the streets and alleyways adding to the Havana mystique. MFM: The level of activity outside in the streets continually fascinated me. I could always hear music and talking and laughing and shouting whenever I stuck my head outside – day or night. What moment(s) made you realize just how unique the music scene in Cuba is? TM: When we were sitting in that tiny little theater being completely educated (in Spanish no less!) by Jose Eladio Amat on the history of clave, I knew it was something special. He made us fully aware of how Cuban music was the driving force of the Cuban experience. DB: I took my trombone with me and played, not only on my recording session, but also with local musicians at tourist hotels. It is refreshing to know that musicians are able to work together and perform together in Cuba just as anywhere else in the world. How did your experience with the local musicians in Havana affect your approach as a composer and as a musician? JC: I will be more likely to compose Big Band scores after listening live to the interpretation of a colleague’s work. MM: These interactions reinforced the idea of connections between genres and cultures, reminding me that musicians just want to play music and the style or aesthetic is not the most important part of the process. MB: I was impressed with the general musicianship of all involved. I also had a chance to attend the concert in the church in the San Francisco square where Michael Murray’s ‘After the Fall’ was performed and was extremely impressed by the choral group. Being in Cuba and hearing performances by the local highly skilled musicians and singers was an enriching experience for me as musician and composer. DB: It was certainly reaffirming to be reminded that music is truly universal. Humans from all cultures have been making music for at least 40,000 years. Clearly, music-making is part of what defines our humanity. BB: For a long time I had been interested in writing and arranging for multiple instruments. When I heard the results of having my music arranged by someone else, it propelled me to further my development as a composer. Part of the trip involved you attending workshops and visiting cultural landmarks and museums in Havana – how did these events help shape your experience with Cuban culture? MM: To visit Cuba and not investigate the cultural landscape would be a tragedy. One of my main interests in going was to explore the political and artistic history of the country. It is much easier to understand a culture once you have investigated those things that it holds dear. DB: These events are crucial to understanding the history and culture of Cuba. BB: The percussion workshop demonstrated the broad range of rhythms which gives much of Cuban music a unique flavor. Havana’s beautiful Museum of the Revolution housed in what had been the Presidential Palace has an extraordinary collection representing the culture and history of Cuba, which gave me a greater understanding of the history, innovations, and traditions of Cuba. What was your biggest take away from the trip overall? TM: The biggest take-away was the realization of just how much the people of this planet miss out on because of the big ideologies of little men. What a shame that so few can control so many, thus depriving them of these incredible cultural exchanges. Just think where the Cuban people would be had 1964 never happened!! Thank God for 2015!! We may not always agree with the choices our governments make, but the people are the ones who suffer and are deprived because of those decisions. So many things we take for granted – simple basic necessities – the Cuban people do without. MM: Music is music. I met other composers from the U. S. and musicians and non-musicinas from Cuba. All have different backgrounds, different histories, and different aesthetics. All center their musical life on different elements/styles. Yet, we all have a connection to sounds that are created as a means of discourse on the human condition. We all seek to explore the possibilities within that discourse regardless of our history or aesthetic. MFM: Like most Americans, I did not know what to expect. What I found was a curious mixture of it being just like anywhere else and being totally unique at the same time. I have made some excellent connections with a few Cubans, and I expect these friendships to continue. DB: I was delighted by the reaffirmation that music is a common denominator among people from diverse cultures. Also, I discovered that I still have no skills at salsa dancing! BB: My biggest takeaways were the camaraderie of our group of composers, the opportunity to interact with and hear the marvelous musicians playing and recording my music, and the entire Cuban (Havana) experience. ABRAZO will be available physically and digitally on Friday. In the meantime, you can hear some clips from the album via the YouTube player below. Happy listening!